Experiencing a tremendous growth in student enrollment, the Colorado School of Mines’ mission is: to maintain the highest academic standards and keep pace with facility and programming needs to promote good health, wellness, personal development, and Ore Digger student-athlete challenges. 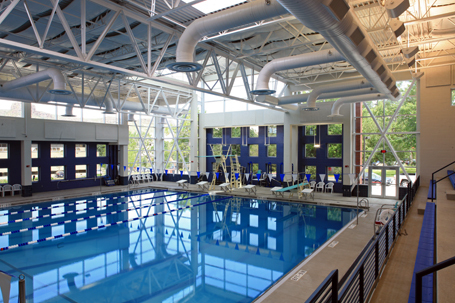 The school commissioned Counsilman-Hunsaker in association with Sink Combs Dethlefs to design a state-of-the-art natatorium for the school’s new three-level 108,000 sq. ft. Student Recreation Center. The aquatic center’s main goal was designed to capture both competition and recreation programming activities. Other programming spaces include an elevated running track; competition gymnasium with seating for 2,500 spectators; multi-purpose gymnasium; climbing wall; fitness center; student and team locker rooms; juice bar; student lounges; multi-purpose rooms; and administrative offices.